Nearly thirteen years ago, just a few days after our country was devastated by 9-11, I started writing a book about a woman who wanted to fall in love but couldn’t see past color. The connection between the tragedy and the romance was simply that I had a hard time processing the pictures of survivors, who were covered in gray ash, without the benefit of knowing their skin color. The Lord was not happy. He prompted me to explore my own prejudices because if I couldn’t pray for people without using racially-defining adjectives, I had a SERIOUS problem. Writing Boaz Brown was life-changing because the main issue was one that had been brewing in my heart for as long as I could remember; an undercurrent of resentment that I didn’t even recognize as sin. But God. Starting with this book, He has changed my heart and given me spiritual eyes to see that prejudice has no place in the heart of a believer. Discernment – yes, but prejudice – no. And He has continued to prove His words to me over these 10+ years. For years, people asked me if I was going to write a sequel and I would heartily reply, “No! They lived happily ever after, all right?” But then a funny thing started to happen last year: I missed LaShondra and Stelson. What were they up to? Did they have kids? How many? How had they grown? Did her father ever accept Stelson into the family? Aside from my curiosity, I wanted to explore issues of race within the context of the story. But something else emerged as I was writing–the issue of healing. Now, I don’t want to give the story away (insert smiley face), but these characters and their story has, once again, pushed me toward a deeper revelation of Christ’s declaration: It is finished (John 19:30). Jesus is finished. Whatever He is going to do has already been done once and for all. And just like before, I look forward to God revealing Himself through the scriptures as He did with these characters. He is a faithful teacher, a faithful keeper, and faithful to His word. 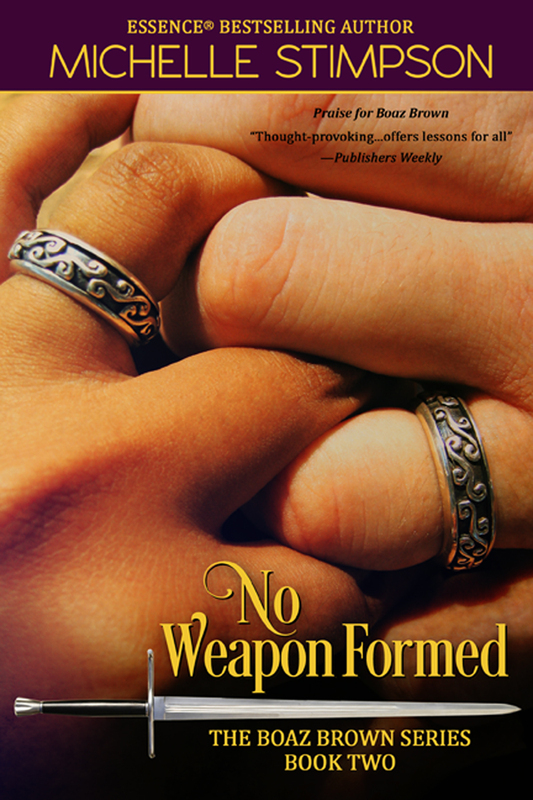 I pray that No Weapon Formed, like it’s prequel, will be a blessing to you. Please feel free to share books that have touched your life in the comments section. And I’d like to pose the question to my fellow Christian authors, too: How has writing been a blessing to you? Has God ever changed your heart because of something to wrote?